It’s probably vanity to believe that Disney read my DVD review of the first triple-release of features by master animator Hayao Miyazaki. Nevertheless, many of my complaints have been addressed in this second release of three more Miyazaki (and Studio Ghibli) features on DVD. The three new titles released by Disney are Nausicaä of the Valley of the Wind, Porco Rosso, and The Cat Returns. Only the first two are actually directed by Miyazaki. The third is a Studio Ghibli release (Miyazaki’s studio); the movie was directed by former animator and first-time director Hiroyuki Morita. Each movie comes as a two-disc set. The second disc always repeats the movie with full soundtrack, and with sketches and storyboards instead of the finished film. This seems like a feature with such a limited appeal that it may not be worth the price of a second disc for the average consumer. Each movie has Japanese and English audio tracks. I made a point to watch both the Japanese version (with subtitles) and the spoken English version. In some cases, the Japanese track seemed a better fit. In particular, I found Michael Keaton’s gruff Porco Rosso to be distracting. But surprisingly often, the English track was just as good, and often the emotion of the scene was more accessible and engaging in my native tongue. Give credit to the Disney team for so carefully and lovingly re-creating the dialogue tracks. Speaking of which, each disc also includes a “behind the microphone” feature that shows the English-speaking actors recording their dialogue, speaking about the process, and praising Miyazaki and Disney for bringing their vision to life. I enjoyed watching these features after the movie and finding out whose voice it was that sounded so familiar. Best of all, none of these features is too long. Like her namesake from Greek mythology, Nausicaä is a princess, although the similarity ends there. Her people live in a valley where they harvest the wind to mill grain. Nearby is the toxic Sea of Decay, but these people have learned to coexist with its most terrifying tank-like monsters, the ohmu. A wayward ship crashes in their valley, with evidence that the balance of the Sea of Decay has been upset. Nausicaä must save her kingdom from the crazed ohmu, restore peace among three nations, and restore the ecological balance with the Sea of Decay. The synthesizer-heavy music dates this movie from the 1980s, but the fantastic visuals are timeless. In the valley are wind-catchers of all kinds, that hint at an atmosphere much more real and three-dimensional than almost any other animated feature. The windmills at night are beautiful. With the valley of the wind, Miyazaiki created a whole world, not merely a background or a setting. The movie’s condemnation of man’s damage to the environment is an echo of the Godzilla movies (and others) that have obsessed Japan since Hiroshima and Nagasaki. The message is simplistic, almost clichéd, but Miyazaki approaches it as a wide-eyed innocent. The tone of the film is visceral, surreal, and organically fantastic. Its world is beautiful, yet unsettling, like an elephant, a beetle, or a venus flytrap might seem to a child for the first time. The disc for Nausicaä includes the made-for-TV documentary The Birth Story of Studio Ghibli, made for Japanese TV in 1998. Through interviews with producer Isao Takahata, it explains how the studio got its name (Miyazaki is an airplane nut, and Ghibli is an Italian aircraft — it also means “hot wind,” which is the effect they wanted to have on the industry). It also walks us through each of the Ghibli films and TV shows through 1998. Porco Rosso (until now, its English title has been The Crimson Pig) may be the film most closely tied to Miyazaki’s own hobbies. As revealed elsewhere, “Ghibli” is the name of an Italian plane, a lifelong fascination of Miyazaki’s. So here is a film, set in Italy, and dealing with a community of sea plane pilots. Our protagonist’s engine even carries the name “Ghibli.” It’s seems the perfect fit for Miyazaki. Miyazaki’s films have always had a fantastic element to them, so for no apparent reason other than adding an element of fantasy, the protagonist of this film has been turned into a pig. Yes, the best seaplane pilot in Italy is a pig. Of the three movies, the story may be weakest in Porco Rosso. The setting, the visual style, the characters and machines are all fantastic (in both senses of the word). But the story itself seems secondary. The newest of the three films is The Cat Returns. It’s a spinoff from Ghibli’s 1995 movie Whisper of the Heart. It’s about a girl who saves a cat from traffic. The cat was a prince of the Cat Kingdom, and as gratitude, the king betrothes the prince to the girl. (“Will you accept these crackers as a symbol of my love for you?”) But she’s not sure she wants to marry a cat, so she seeks the help of Mutah (another cat), from The Cat Bureau. As my wife says, if this were an American film, she’d find it weird, but somehow it’s easier to accept as a Japanese anime. This film seems much more “kid oriented” than the others. It’s deliberately less deep, less philosophical, and much less dark. There is some appeal for adults in the observant animation, and the pop song by the ukelele player over the end credits is beautiful. But as a whole, it feels like “Miyazaki lite,” and that’s a mild disappointment. This disc has a documentary called “The Secret Story of the Cat Returns.” It’s the usual talking-head interview featurette, including appearances by the ukelele singer Tsuji Ayano, and many of the animators and writers. 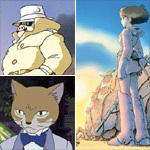 The most noteworthy factoid is that The Cat Returns is based on a story written by a character in Whisper of the Heart. In each case, the movie is encoded in Dolby Digital and presented in its original widescreen aspect ratio. Porco Rosso and Nausicaä are both THX certified. The picture quality of all three is excellent. The oldest film is Nausicaä, and it looks wonderful. The Cat Returns is only 2 years old, and in spite of a trailer that looks badly recorded straight to video, the feature itself looks as good as the rest. None of these films made as big an impression on me as did Kiki’s Delivery Service, Princess Mononoke, or Spirited Away. But I’ve come to love Miyazaki’s work and respect Disney’s translations into English. These three are a proud addition to my own DVD collection. There are a few more Miyazaki films, and still more Ghibli films by other directors that Disney is welcome to release on DVD. I’ll be first in line.